Last weekend we decided that a visit to the Grand Bazaar of Istanbul was in order. We heard stories of pick-pockets and aggressive salesmen, of tourist traps and kitschy souvenirs. I have to say though, I was quite impressed. Although it is evident that most of the trade is carried out for and with tourists, there remains a sense of authenticity and cultural tenacity. We walked from our apartment across one of the many bridges of Istanbul. 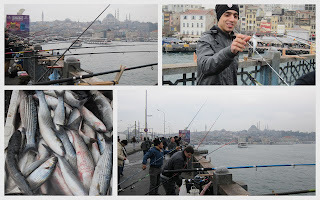 Hundreds of men were fishing on both sides of the bridge, chatting and drinking tea as they waited for their lines to tug. We followed the crowds once we were on the other side of the bridge—weaving our way through shops and crowds it became clear to us that the Bazaar culture is alive and well. How else would the Turkish people shop? This Bazaar was completed in 1481, although it has been added to over the years. According Wikipedia, it has "over 4,000 shops which attract between 250,000 and half a million visitors daily". It is VERY easy to get lost inside, and don't even try to see everything. Thankfully, it is organized into districts - the rugs are in the center, their are 2 different corridors of fabrics, in another place to will find mostly ceramics. And there is the gold section - gold and jewels. This is my favorite photo from the day - the bolts and bolts of fabric - all the traditional patterns and weaves of Turkey. I could go crazy buying fabric in this city. I did buy some silk Ikat (Below). From the Grand Bazaar we wondered over to the Spice Market. You will have to wait until the next post to see those pictures! And all those pretty, pretty dishes. Ooh, what fun. Love these posts! Keep 'em comin'!